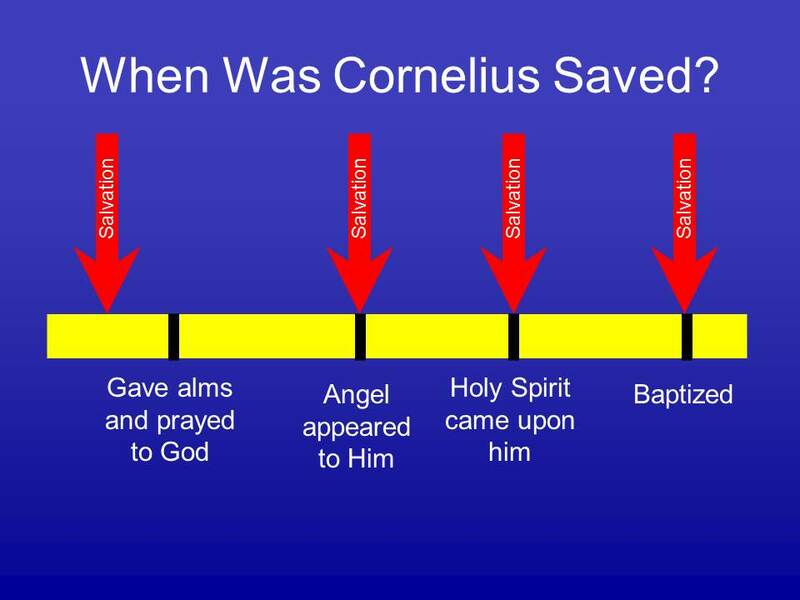 Some people argue that one does not need to be baptized using the conversion of Cornelius and the Holy Spirit’s presence at his conversion as their example. However, a close examination of the Bible account in Acts 10 and 11 teaches the exact opposite. Cornelius and his household was a peculiar case of conversion in the book of Acts in that He is the first non-Jewish convert: the opening of the gospel to the Gentile world. We must be careful not to make a broad application of this unique story to all conversions or put it at odds with other passages about salvation. The story begin in Acts 10. Cornelius, a Roman military official, receives a vision of an angel of God instructing him to get the apostle Peter who is staying in Joppa. He is instructed to send for Peter because he would tell Cornelius “what he must do,” Acts 10:6. As Cornelius’s servants approach the house Peter has a series of visions in which he sees animals that the Old Law declared unclean and a voice telling him to kill and eat them. Peter, in respect of the Law, refused and received the reply “What God has cleansed you must not call common.” Peter was perplexed about the vision when the servants of Cornelius arrive. The Holy Spirit told Peter to go with them for He sent them. The next day Peter and several of the Jewish brethren went to Cornelius. At this point the Holy Spirit fell on Cornelius and those who heard the word and they began to speak tongues as Peter and the apostles did on the Day of Pentecost (Acts 2). The Jewish Christians with Peter were astonished at this and Peter said, “can anyone forbid water to these who received the Holy Spirit in the manner we did?” (Acts 10:47). Then Peter commanded them to be baptized. When Peter returned to Jerusalem some of the Jewish Christians confronted Peter because he ate with the Gentiles. Peter explained the whole account from the vision and the Holy Spirit coming on the Gentiles as it did upon the apostles “at the beginning” (Day of Pentecost in Acts 2). Peter realized he would be withstanding God if he forbid the Gentles to be baptized. The Jewish Christians then glorified God saying “Then God has also granted to the Gentiles repentance to life,” Acts 11:18. 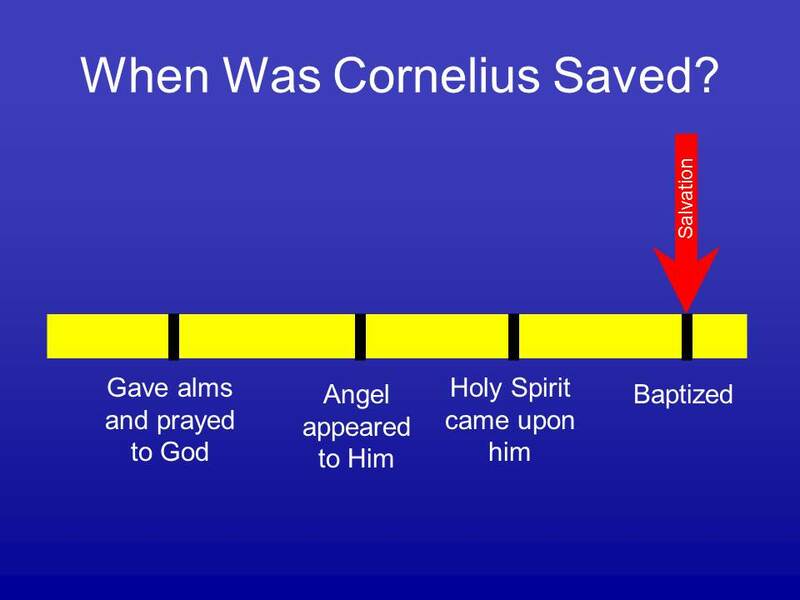 When we consider the story of Cornelius we must understand when he was saved. According to Acts 11:14, he was not saved before the preaching of the word. This poses a problem for some who follow a popular teaching called Calvinism. Many religious bodies follow the teaching of John Calvin who taught the salvation of man by grace alone and the impossibility of being lost. Calvin said man was born in sin and cannot seek God unless God regenerates the man so that He will seek God. According to Calvin, at this point of regeneration the person is saved and will then seek God’s will. Cornelius was a devout religious man before he was told to send to Peter who would tell him words by which he would be saved! How could Cornelius have been baptized by the Holy Spirit after Peter’s preaching when he had to have already been baptized by the Holy Spirit so he could seek God in the first place? The manifestation of the Holy Spirit proved to the Jews that the Gentiles could be saved. As demonstrated in Acts 11, there was Jewish prejudice against the Gentiles. The Gentiles, like the animals in Peter’s vision, were considered common and unclean because they had not been circumcised and did not follow the Law of Moses. Acts 10:27-29 records how God had to send a vision three times to tell Peter that no man can call unclean those whom God has cleansed. When Peter returned from Cornelius, the Jews chastised Peter for teaching the Gentiles, Acts 11:1-2. This conversion account is as much about the conversion of the Jews to the idea of equal access to salvation through Jesus Christ as it is about the conversion of the Gentiles. The Old Law had been abolished by Jesus when He fulfilled it. According to Ephesians 2:11-18, the removal of the Old Law was a removal of the division between the Jews and the Gentiles. However, the gospel had not been preached to the Gentiles yet. The Jews were to no longer consider the Gentiles unclean but equal. The Jews, steeped in tradition and separation from the Gentiles, needed something profound to show them that the gospel was for all men. Through divine means, God brought together these separate worlds. God sent the Holy Spirit to show Peter and the Jews with him that the Gentiles could be baptized. The Jews were amazed because the Holy Spirit fell on them as it did at the beginning. It is important to note that they did not refer to the Holy Spirit coming upon every convert like this. In fact, the conversion of the Samaritans in Acts 8 shows that after the Day of Pentecost, the Holy Spirit only came on individuals by the laying on of the apostles hands, Acts 8:16-18. The baptism of the Holy Spirit here proved that God would allow them to be baptized, Acts 10:47-48 and Acts 15:7-9 (when Peter again refers to this event). In the baptism of the Holy Spirit here we do not have a pattern for every conversion. The gospel going to the Gentiles was as dramatic of an event as the beginning of the church. In Acts 2, the Holy Spirit fell on the apostles to demonstrate that Jesus had ascended to the right hand of God. In Acts 10, the presence of the Holy Spirit showed that the Gentiles could be baptized in the name of Jesus. This was not a common occurrence. Acts 11:15 refers to “the beginning” of the church, not to every conversion since that time. In order to be saved Cornelius needed to hear and obey what God commanded him to do through Peter’s instruction. If the baptism of the Holy Spirit saved Cornelius, Peter would be commanding Cornelius to do something he had not control over. The Spirit follows the will of the Father; not the will of man. You cannot command someone to be baptized of the Holy Spirit. Peter commanded Cornelius and his audience to be baptized. Notice this was a baptism, immersion, in water for Peter said none should forbid them water. Water baptism was a baptism that a person could command and a person could obey. Peter went to a lost man to preach the word of salvation. Peter preached Christ to Cornelius and his household. Cornelius and his household believed the words of Peter and were ready to do what God commanded to be done according to what He commanded them to teach. Jesus commanded Peter and the apostles to teach the gospel and baptize those who wanted to be believers in order for them to be saved (Matt. 28:19-20; Mark 16:15-16). However, the Jews were not convinced the Gentiles could be baptized. The Holy Spirit came upon Cornelius and his household as it came upon the apostles when the gospel was first preached at Pentecost. Seeing God’s approval, Peter baptized the Gentiles, their response to the words of salvation. The sign was such that the Jews in Jerusalem who chastised Peter for being with the Gentiles realized that the Gentiles could be saved and they ceased complaining and glorified God. In a Acts 15, Peter recounted this incident to show that there was no longer a distinction between the Jews and the Gentiles in the kingdom of God. After this incident, there is no other account of the Holy Spirit coming upon man in this fashion for they were unique periods of Bible history. Peter and the other disciples continued to preach words by which one could be saved and commanded listeners to obey God by repenting of their sins (Acts 2:38), confessing Jesus (Acts 8:36-39; Romans 10:8-9), and being baptized into Christ (Acts 2:38; Acts 8:36-39; Romans 6:1-4; Galatians 3:26-27).